I have a couple of tips for Hutchison Three X-series users to share. Premium numbers include 0845 (lo-call numbers!). 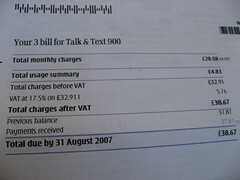 I accidentally called their directory enquiries number and was charged 1.915 GBP ex-VAT! So what do you do when you want to call an 0845 number, once you’ve disabled them? I recommend activating Truphone on your handset for such calls. Since I now have a Macbook I hoped to use my Nokia E65 as a modem and take advantage of my unlimited internet plan as I currently hardly use it. To my disappointment, I discovered it doesn’t work unless you buy an 10GBP a month upgrade. I think this is ridiculous as I assumed I could use my E65 as a modem with a laptop when I first purchased it. 10GBP extra a month to some might sound worth it, but I already have broadband at home and work. I am not switching to high latency 25kB/sec (optimal) 3G wireless!! Who would?! And where would I be using 3G data with my laptop? On infrequent train journeys in the UK where 3G connections can be described as patchy at best.